Since last few months I was looking to buy a car. It’s often said by wise people to always go for a new car rather than an old car. I was too confused and kept doing research on both old and new options. While in my budget I could have gone for a mid segment sedan but I was keen on a SUV or a bigger sedan. That is when I decided to go beyond conventional wisdom and started to look for used car options. Since I am no expert in cars I opted out for going to any used car dealer spread all across Delhi NCR. I looked at various online portals of leading car manufacturers and liked a few options at Mahindra First Choice website. 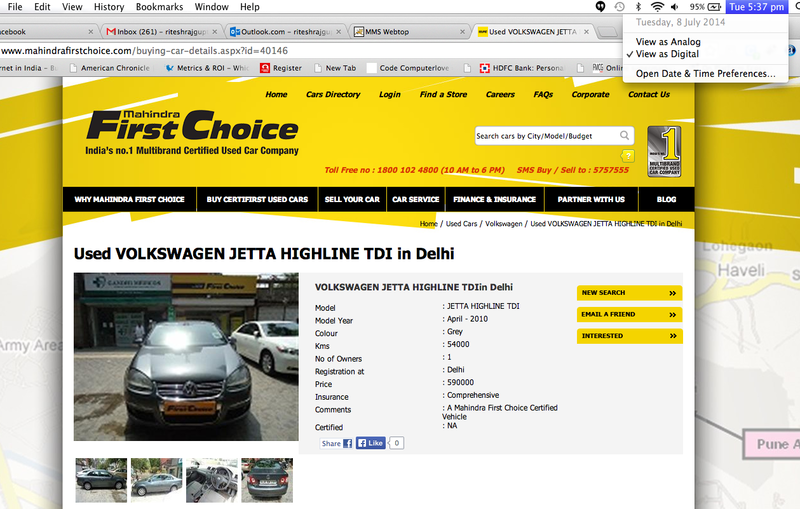 I saw a 2010 VW Jetta Highline at a cost, which was quite tempting. I sent an online enquiry and got a call from the MFC dealer the next day. He sent pictures and told me all details which obviously were same as mentioned on the website. He invited me to visit the showroom to take a test drive. I visited the showroom on 2nd July and liked the car as it was looking spotless, I even drove the car and all seemed fine. Like a typical sales person the exec there amongst other things said that you are at Mahindra First choice and unlike other used car dealers our job starts the day we deliver a car. You will get complete peace of mind on account of 118 tests they do before buying any car. Over and above that we offer 6 months free warranty and 3 free services. I asked for service record but I was told that it is with Mahindra itself and they do the check themselves. The only reported issue with the car was a default in the rear power window, which I was told will be replaced as soon as the part was available with VW. The other missing thing was a claimed CD changer which I was told will be given at delivery time. I was too overwhelmed by the occasion and did the biggest blunder of my life, I was show n the photocopy of the RC and I did miss out on checking the Manufacturing date and year. (Will share the consequences of this later). I paid and advance amount and booked the car and was promised the delivery on 4th july. I visited the showroom on 4th july 2014 and paid the full amount and took the car delivery. I was told that there is no external CD changer but the inbuilt in dashboard CD changer. I was not carrying and CDs so couldn’t test it. After just moving 50 meters the gear knob just came into my hand, I got it fixed by the “mistri” at the MFC showroom and he told me that may be because lot of people have done a test drive it had become loose. I accepted it and moved on. Again after going 50 meters I released that the AC was not coming on. I again went back to the showroom and was told that I was not doing the settings correct and that’s why it was not working. Ok, I admitted it again and finally moved on. My entire drive from there to Home was marked with AC going on and off again and again. I was under the impression that I might have pressed some button and that’s why it is not working. The same thing kept happening for next 2 days and it was quite embarrassing in front of my family & friends. I called the sales exec on 6th july and reported the the AC issue and he very normally said that you get the car here and we will get it checked. He didn’t sound surprised at all giving me a hint that they were aware of the issue. He said he will inform me on Monday when can I get the car for inspection. Monday I followed up and 1st told Saturday and then Wednesday to leave the car. I had no option but to accept. Monday evening I opened up the received documents to get the insurance documents name changed and that is when I got a shock of my life, the documents read that the model was 2009 and registered in May 2009. I checked and double-checked and that is when I realised my mistake. I trusted whatever was mentioned on the site and didn’t check the documents properly. Yes I was stupid enough and yes I was conned. I rechecked the Mahindra Site and found that the car is still listed as 2010. I immediately sent an email to the contact us email with a screenshot of the listing on the site. I called up the sales exec and he immediately said the obvious, “We showed you all documents and we cant do anything”, When I confronted him with website listing he says "no I was wrong and website it shows 2009. I sent him the email with screenshot. He said he will talk to seniors and will get back. Next day I sent an FB message to MFC Page with screen shot and all details. I immediately got a standard response assuring that someone will call me. I did get a call and I explained the situation, the person on call told me that they are forwarding the issue to a senior and he will get a call back. In evening I got a call back from a Mahindra Employee (Name withheld) who again asked me the entire issue. He asked me to fwd me the screenshots on his official ID and assured me he will look into it as he was driving at that time. He also suggested that I should call up the owner of the dealership to resolve the issue. Reluctantly I called up the owner and was asked by him to meet him in his showroom the next day. Next day (wed) I visited the showroom in evening and explained the entire thing to the owner. He very sweetly explained me that we have showed you every documents and we are not responsible. On the defunct AC, CD changer etc he said he can get the AC, power window and gear knob checked. On the missing CD changer he had a simple answer that this is a standard fitment and he cannot do anything. I had by now accepted that its all my blunder. They are not going to accept any error or mistake. In the meanwhile I never heard back from the senior executive of Mahindra and by now I had given up. On Friday I gave the car for repair of the defunct parts and was promised speedy delivery. Within 15 minutes I got a call from the showroom senior manager that because I have lodged a complaint against them, I will 1st have to give an undertaking email that I have no further complaints and only then they will touch the car for repair, If I don’t do it they will only repair the car next week Tuesday as their owner was out of country. I didn’t accept this and immediately called the senior exec at Mahindra, I asked him about my original complaint and he had no answers, he was still trying to deny that the car was still listed on the site as 2010 model. I understood that I am not going to help on the model issue. So I asked his action on the current blackmailing by the delaer. He intervened and advised the dealer to repair the car immediately and get a letter signed post repairs. 1. WHAT IS THE RELIABILITY OF ANY LISTING ON YOUR SITE. IF THE DETAILS SHOWN OF A VEHICLE DOESN’T MATCH WHO IS RESPONSIBLE? 2. WHAT AND HOW ARE THE CLAIMED 118 TESTS DONE ON ANY VEHICLE ACQUIRED BY YOU. IF BASIC THINGS LIKE GEAR KNOB AND AC DOESN’T WORK THAN HOW CAN ANY USER TRUST YOU? 3. HOW ARE YOU ANY DIFFERENT THAT ROADSIDE CAR DEALER. YOUR DEALERS AND TEAM GIVE SAME OR EVEN WORSE EXCUSES THAN THEM.